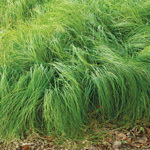 An almost evergreen sedge that thrives in the mid-day shade of trees, particularly cedar trees. It is often found in crevices of limestone bluffs. This is a deer tolerant plant. It has a very fine leaf texture. 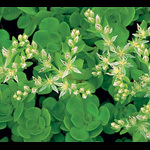 Use as a groundcover or "green mulch" in shady wildflower beds; it spreads slowly by rhizomes. 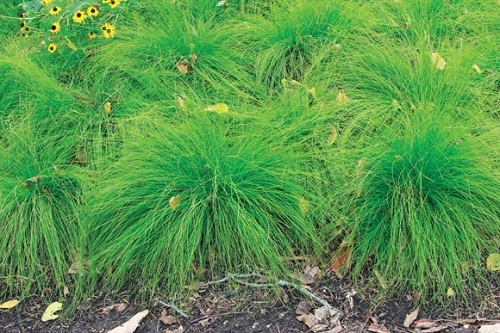 Six- to 10-inch diameter clumps can form from our 2-inch plants in a single growing season. Seed can be collected a little on the green side beginning in late April but more often is harvested in May or June. It germinates best if you sow it right away; some will come up about two months later, and the rest will be up the following spring. Q: Will this grow under white pines? A: Yes, it will grow under pines. You might also consider Pennsylvania sedge (Carex pensylvanica) if you want a sedge that will spread more rapidly. Q: If the bloom time is May-July, how can you be collecting seed in late April? Is the bloom time incorrect? A: The blooming period usually lasts 1 to 2 weeks, so if a population was blooming in early April, you could find ripe or nearly ripe seeds at the end of April. Twice in the last 10 years, we've harvested seed in the last week of April. We've also gotten seed as late as June 22. So the typical blooming period is May - July; and, because the blooming period is brief, the typical time to look for seed is also May - July. However, some years "start" a little early, and you could begin looking for seed in April if we are having an early spring. 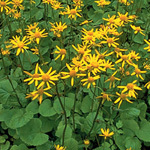 If you have these plants, or know where they are growing, visit them frequently in the spring to see what they're up to. You may see some plants blooming while others have already formed seeds. You'll be able to get some seeds a few weeks after you see them blooming. The seeds will be tiny and black when ripe. Sow them right away for the best results. We should probably add April to the bloom time. Thanks for noticing. Q: Is this a well-behaved plant that will stay in a bed? I'd like a ground cover but don't want anything that will get out of control. A: Yes, it is well-behaved. Over time it should spread some, but it isn't competitive enough to displace other plants.